Yes,you can Barbell - Squat! It's easy to do "Squat 100 times", and I think it is the evidence that load is too light. You must take load to really strengthen a lower part of the body. After all You should challenge Barbell squat by all means. You are not scared to hurt a waist and a knee if you hold down even basics. Rather is it good for a waist and a knee if you wear how to use right hip joint and human trunk by a squat. 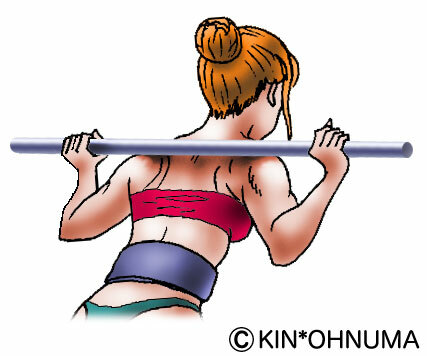 Let'ts try Barbell - Squat!! I hear a lot of stories that "a barbell shaft hits the back of the neck and well has a pain in it". This is because a shaft gets on the seventh cervical spine (the back and the bone of the neck sticking out) of the neck and proves right. Oh My God! You should put a barbell shaft on the shoulder. Keep shoulder blades adduction and stick out a chest.Then a trapezius from back to a neck swells. *In this way cervical spine does not hit a shaft under cover of the depths of the trapezius. There is just a shaft in the spot on the border of a trapezius and rear deltoid. There is the squat not only to carry a shaft on shoulder, but also pick up higher position = on Ttrapezius. In this case you emphasize ttrapezius rising action more and push out the neck a little forward so that there is easy to be a shaft. When the position of the shaft becomes higher, the distance from a crotch joint to a barbell shaft becomes long and the upper part of the body just bend forward. As a result weight does not get on on a center of gravity, burden to a waist increases without letting a barbell go up and down over a straight line (look lower illustration). 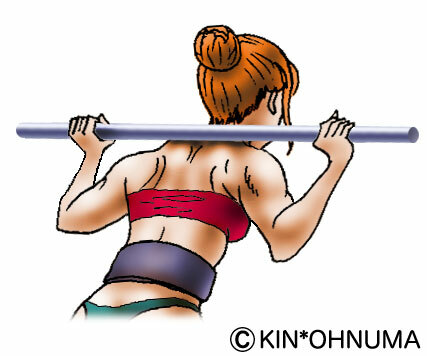 When high bar, knee moves back and forth, I push forward basic low bar squat to put a shaft on the shoulder. Grip width is wide is easy to take balance.